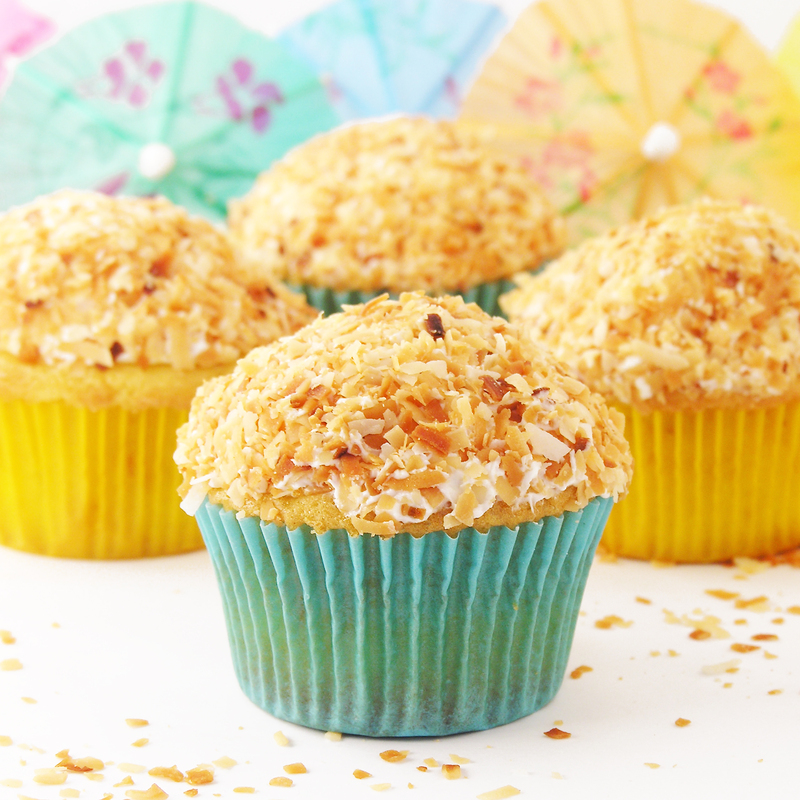 These pineapple cupcakes are full of coconut and rum flavored happiness. A perfect pool party treat! Aren’t these just the cutest little things? I love the flavor combination of coconut and pineapple, it is such a refreshing taste! The light whipped frosting on these, combined with the crunch of toasted coconut makes them such a delicious summer treat! 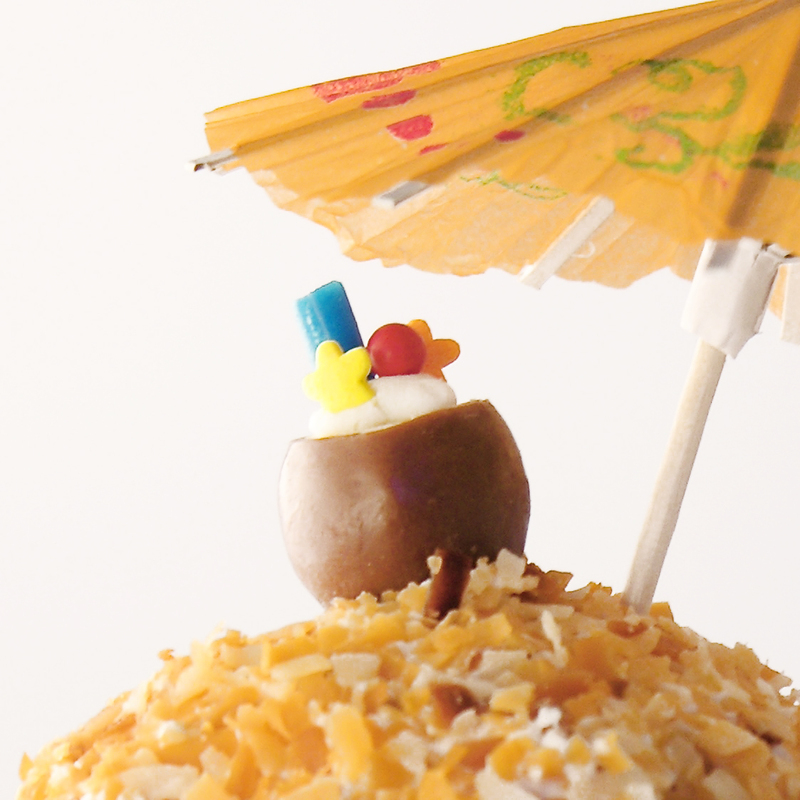 I even added a cute little edible coconut drink topper that I found on Party Pinchers. So. much. fun!!!! 1 boxed pineapple cake mix (I used Duncan Hines), plus water, oil and eggs to make according to box directions. Spread 5 cups of coconut out on a large baking sheet that has edges. Allow coconut to cool, then place in a large zip-top bag, and crush into smaller pieces. Make cake mix according to directions on box, and after it is made, add one cup of crushed, toasted coconut and mix completely into batter. Add 2 teaspoons of rum flavoring and stir completely into batter. Divide batter evenly into 24 cupcake liners placed into tins. Bake according to package directions and cool completely. To make frosting, place butters, coconut flavoring, remaining rum flavoring, and powdered sugar into a large mixing bowl and beat on high for 3 or 4 minutes until very light and fluffy. Add one cup of crushed, toasted coconut and stir until well blended. Use a spoon or a cookie scoop to place a rounded scoop of frosting on the top of each cupcake. 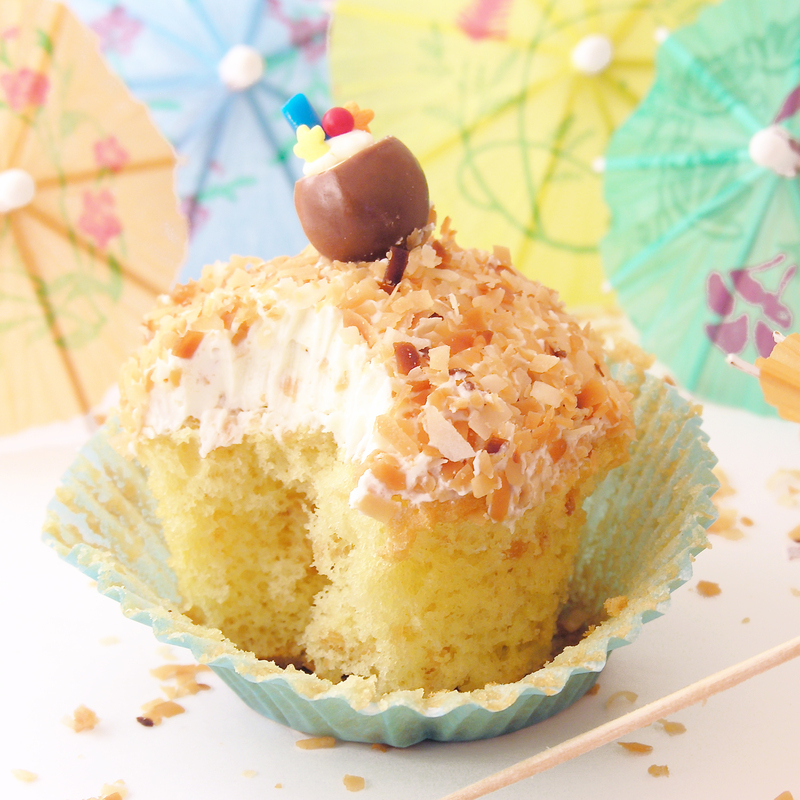 Place the rest of the crushed coconut into a small bowl, and turn each cupcake upside down into it, pressing coconut into the top and sides of each scoop of frosting. Decorate as desired. 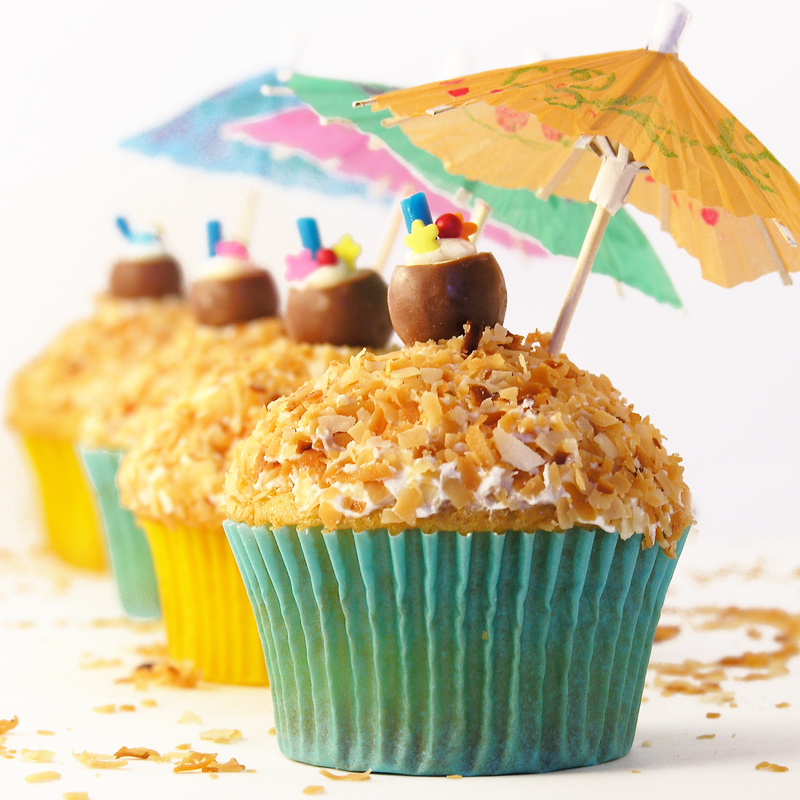 I found these cute little edible “coconut cups” on a site called Party Pinching, and I couldn’t resist making them for my pina colada cupcakes! 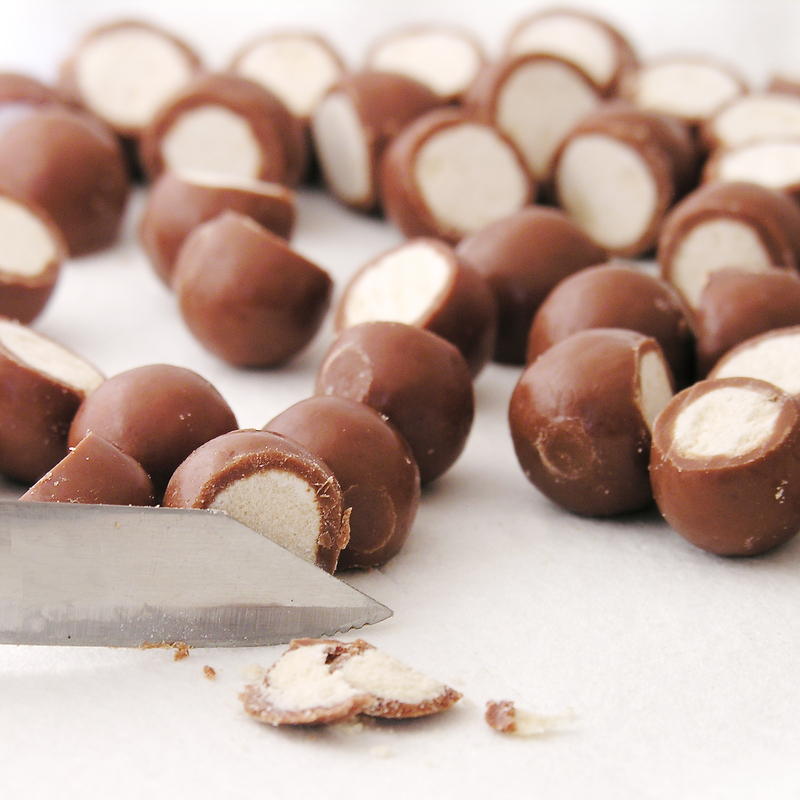 You just cut the tops off of a Whoppers malted milk ball, put a dab of melted white chocolate and add little flower sprinkles and a bit of string licorice. FUN! My thoughts: I really thought these captured the flavors of coconut and pineapple in a perfect combination. I loved the little crunchy bits of coconut in the cake and frosting. These are such a festive cupcake and make a perfect refreshing summer or vacation dessert for all ages! Posted in Cupcakes and tagged baking, buttercream frosting, coconut, cupcakes, dessert, luau, party, pina colada, pineapple, recipe, rum, summer, toasted coconut, whopper drink cups. Bookmark the permalink. Thank you so much! You have such a fun site too! Thanks for stopping by! Those cupcakes are looking so sweet and festive! 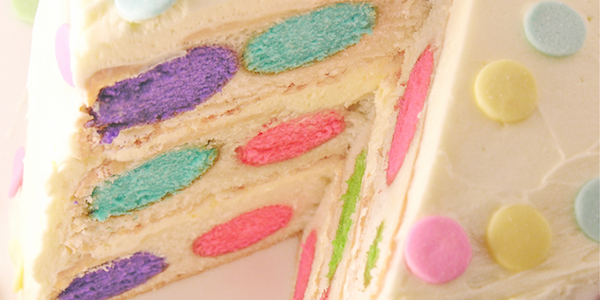 A perfect party treat :). Thanks for stopping by!! These looks so stinkin’ cute! they look gorgeous! what a great idea!